1895 Indian head penny value ranges from $1.75 cents to $2.33 for the normally found heavily worn examples. Nice condition coins with just light wear are worth above $10. As an example of higher value due to its outstanding condition the choice uncirculated 1895 Indian penny pictured is easily worth over $35 to $40. Look just below the value chart to find images and descriptions to compare your coin, giving you an idea of its condition. Indian head pennies remain popular with today’s collectors. Their search for the nicer condition coins is causing any better quality examples to rise in value. Hobbyist realize 1895 pennies are scarce in well defined condition. On your coin, study the headband above Liberty’s eye, if you can clearly see lettering within the headband your coin is worth a premium. Condition and the state of preservation of your old pennies is the deciding factor in value. 1895 Indian pennies are worth a second, closer look. 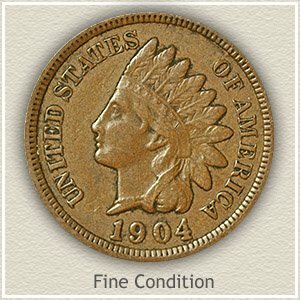 With most of the surviving number unattractive and not something a collector values, all old Indian pennies must be carefully examined for higher value potential. Pictured is an example of a nice condition rarity 1895 Indian penny. This coin was thankfully not released into circulation and therefore it original surfaces and delicate mint luster is intact. It has remained untouched since minting, a rare occurrence. 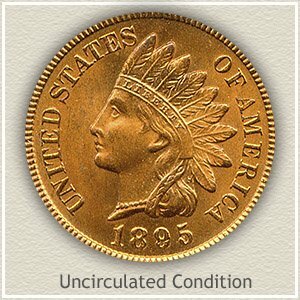 Collectors avidly seek coins of this high condition. Coloring and natural toning further enhances eye appeal, combining a fiery red obverse with a deep gold reverse. Stunning color along with the almost total absence of nicks and marks, results in a truly rare coin. Any collector of Indian pennies would welcome such a nice coin into their collection. David Lawrence rare coin auctions sold this coin amid strong bidding for $149. Old pennies set aside long ago when sold today are realizing high prices because of demand from selective collectors. As you judge the condition of your coin, different amounts of wear are assigned a "grade." 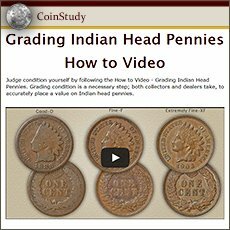 By comparing your coin to the images and determining its grade you can find an accurate 1895 Indian head penny value on the chart. Uncirculated: All the characteristics of a new penny remain on this 1895 penny. The original mint luster is unbroken with no wear to the coin earning it the "uncirculated" grade. Toning to a light brown is possible however rotating the coin under a light reveals undisturbed luster underneath. Examine the highest areas for signs of wear. The first to exhibit abrasions is hair above the eye and curls behind her neck. 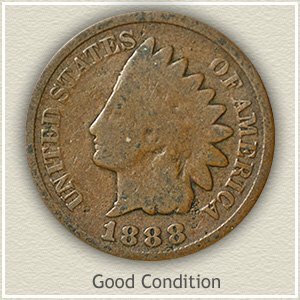 Fine: As a collectible coin, 1895 Indian head penny value is generally double a lesser grade example. Moderate with ample detail remaining is the appearance of a "fine" grade penny. Wear has reduced the highest details considerably but not to the point of merging one into the other. The ribbon behind her neck is still separated from the hair, although worn smooth as it crosses. Her forehead is fully detailed and apart from the headband. The headband despite obvious wear still portrays "Liberty." Good: A complete outline of the feathers, her face and neckline is separated and raised from the background. Lettering is distinct as well as the date. All other parts of the design are now worn away. 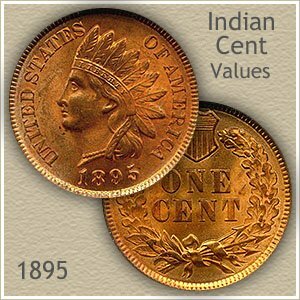 However, 1895 Indian head penny value is affordable and enjoyed by many young collectors. $1 to 2 dollars for common dates. With many advanced collectors pursuing Indian pennies the rare dates along with your 1895 Indian head penny value are moving higher. As always better condition coins are especially sought. Today your box of old coins has never been more valuable.